PHIBLEX 2016 will be held from September 21 to October 9. The U.S. and Philippine militaries are set to hold amphibious landing exercises in the Philippines next week as the two allies work to strengthen their relationships across a range of operations. According to a September 18 statement by the U.S. embassy in the Philippines seen by The Diplomat, the U.S. Marines and Sailors of the 3rd Marine Expeditionary Brigade, the 31st Marine Expeditionary Unit and the Armed Forces of the Philippines (AFP) will be participating in the 31st iteration of the Philippine Amphibious Landing Exercise (PHIBLEX) 2016 from September 21 to October 9 in Luzon. PHIBLEX 16 will include around 650 U.S. service members based in Okinawa, Japan as well as Philippine sailors and marines. It will consist of a command post exercise, field training exercises, amphibious operations, combined arms training, civil-military operations, and humanitarian and civic assistance projects. According to the statement, the command post exercise, which takes place in Palawan, is designed to help increase the AFP’s capability to plan and execute bilateral maritime operations. Humanitarian and civic assistance projects, also in Palawan, will include various engineering projects, efforts to improve local infrastructure and cooperative health engagements. 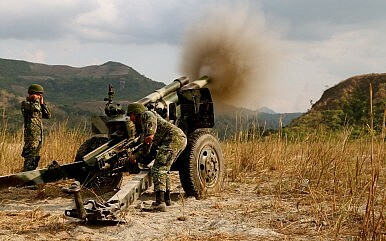 The field training exercises, held in the vicinity of Angeles-Clark, will include small arms and artillery live-fire training. As I have pointed out repeatedly, while attention is often focused overwhelmingly on the U.S.-Philippine alliance as a counterweight to growing Chinese assertiveness in the South China Sea, in reality the military relationship is designed for collaboration across a range of areas from disaster relief to maritime security (See: “The Truth About Philippine Military Modernization and the China Threat”). The embassy statement echoed this broader reading of the alliance with respect to the upcoming exercises. “Bilateral Philippine-U.S. military training opportunities such as PHIBLEX 16 sustain our strong foundation of interoperability and strengthen our working relationships across the range of military operations — from disaster relief to complex expeditionary operations,” the embassy said. PHIBLEX will also help play a major role in preparations for the upcoming large scale annual bilateral Balikatan exercise next year (See: “US, Philippines to Hold Expanded War Games”). Supreme Court upholds constitutionality of the Enhanced Defense Cooperation Agreement.